Boone (Shackelford) is a smuggler of counterfeit perfume and an international adventurer. When a TV news reporter, Jillian Grey (Allen) starts following a story about girls abducted from L.A. and put into white slavery camps, it leads her to the diabolical mastermind Geoffrey Cicero (Landau). Grey and her young daughter are then kidnapped. Meanwhile, three friends, K.C. (Gershon), Tina (Adams) and Lee (Little) are expecting a modeling agent to meet with them. It turns out it’s two of Cicero’s top goons, Sonya (Key) and Gil (Landi). The three girls are also kidnapped. When the girls, Jillian, and Boone all end up crossing paths, they make an unlikely force and they all fight to escape the clutches of Cicero and his minions. Will they get SWEET REVENGE? 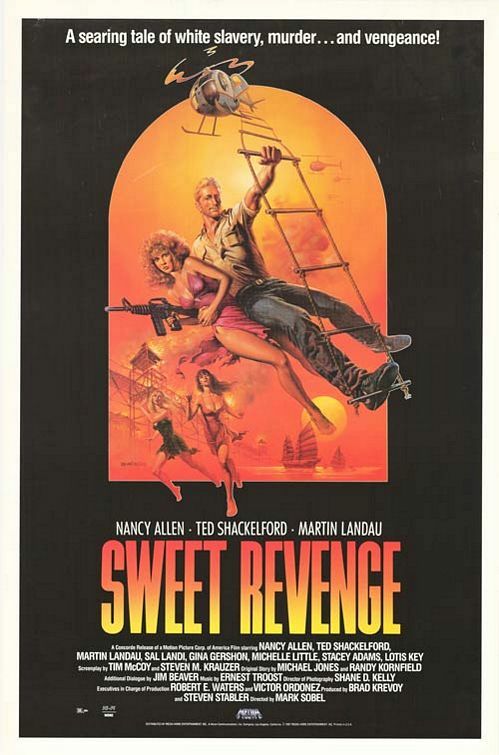 While mostly a TV actor, Sweet Revenge seems to be the only starring film role of one Theodore T. Shackelford III, who modestly just goes by “Ted”. While he’s supposed to be an Indiana Jones-type hero, his smug, glib one-liners (which were perfect for the 80’s, let’s not forget) do tend to undercut the audience’s faith in him as a powerful central hero. He’s more of a jokester, a goofball. But the movie as a whole has a cartoonish, comic-booky vibe, where opponents are easily knocked over by the slightest touch, and muzzle flashes look painted-on. Add some triumphant, A-Team-style music over it all, and you have some dumb, but not offensively bad, video store shelf-filler that only could have existed in the 80’s. Not to be confused with Best Revenge (1984), One Man Out (1989), Cocaine Wars (1985), or a myriad other items of this type, you really have to be a fan of rediscovering movies otherwise left languishing on video store shelves to appreciate Sweet Revenge. It has a lot of the hallmarks we look for when it comes to 80’s action: the disco scene, at least one pinball machine, exploding huts, and an exploding helicopter. But the movie it resembles most is Catch the Heat (1987). The goofy tone is similar, the climax is almost exactly the same, and they each got one major star: Catch the Heat got Rod Steiger, this has Martin Landau. 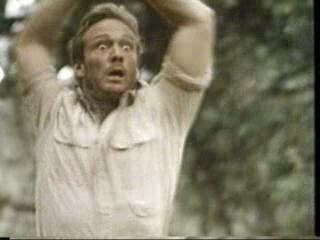 It must have been fun for Nancy Allen and Gina Gershon to run around the Philippines shooting machine guns and such. When we’re first introduced to Allen’s character, it seems she’s going to be another in a long line of female reporters who don’t do much. Thankfully, she basically becomes a gun-toting hero, along with her unlikely compatriots, some L.A. girls and Ted Shackelford. Strangely, that description makes the movie sound better than it really is. But the movie was kind of ahead of its time with its look at human trafficking, and Martin Landau as Cicero has his own logo. If you live in a palace surrounded by goons, and you have flags bearing your own personal emblem hanging all over the place, you might as well have a neon sign reading “BADDIE!” also outside your house. But Cicero makes no bones about the fact that he’s evil. He sometimes comes out of his house, says nothing, then turns right around and goes back in. Such are his powers of intimidation. 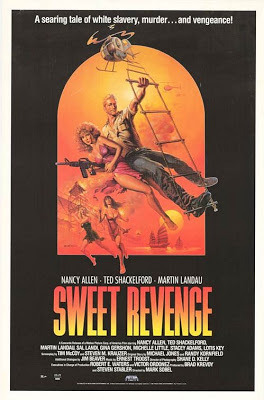 Released on VHS by Media, Sweet Revenge is a lightweight offering in just about every sense of the word. The 79 minute running time reinforces that, and is certainly welcome. While not a must-buy, you could do a lot worse than Sweet Revenge.